Immersed in a historical atmosphere, between the walls which once housed Doge Alvise, the Royal Suite Pisani Grand Canal View welcomes you with enchanting display of light. The view looking out onto the Grand Canal will leave you speechless. From the two out-sitting windows you can admire the Chiesa della Salute, designed by Baldassarre Longhena after the Palladio, the Palazzo Barbarigo with its mosaics, and the Accademia Bridge. It feels as if you are living in a painting. The suite has a spacious living room featuring a beautiful period fireplace which will set the perfect mood for your most relaxing moments, whether you are enjoying a good book, a sip of tea, or an aperitif. The room is elegantly furnished with fine fabrics from the early Venetian tradition. 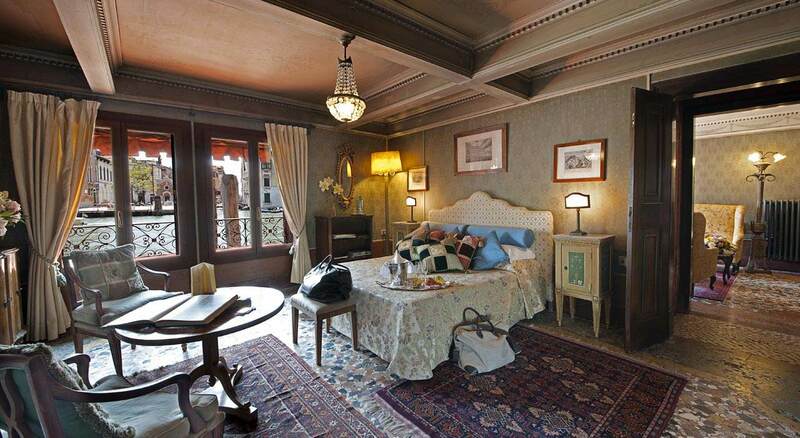 Antique furniture, paintings, and lamps will spoil you in a charming atmosphere that only Venice can offer.